We have made this bangle and pendant to a customers ideas, they are manufactured in 18ct yellow gold , and diamonds being set in 18ct white gold (rubover settings ) . The bangle was solid and with no clasp.She was overjoyed with the finished items ! We have just completed this white gold diamond necklace from a customers design! it is a Christmas present - she collected it yesterday and was celighted with the finished piece ! 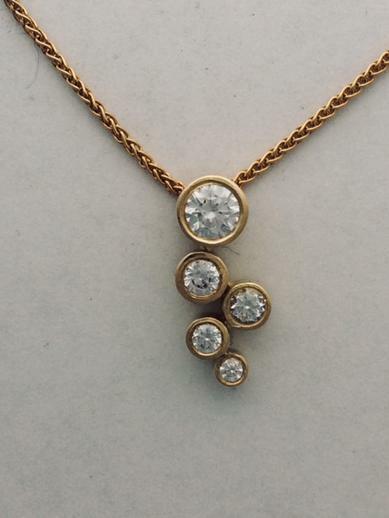 We have just made this diamond necklace- all 18ct yellow gold with 5 diamonds weighing 0.70cts the set, in rubover settings, it is a special order for a Christmas present ! (over the whole of the UK) and also passed his level 2' Diploma in Jewellery Manufacturing ' with top marks,and will be proceeding with his level 3 with us. Congratulations Jubran ! We have just finished this shaped wedding ring to fit against the engagement ring we made 2 years ago, both rings are platinum and diamond set. Blue Topaz is the birthstone for November, shown here is a stunning necklace we manufacture ourselves, in 9ct gold and bluie topaz and diamond, and is in stock at £720 inc. VAT. We have just finished the ruby set for a Ruby Anniversary gift! Our client already had the diamond stud earrings , so we made the ruby base earrings which are removable from the studs, and also a matching necklace ! We have just finished this white gold ruby necklace, set with a square ruby and diamonds, it was to match some ruby and diamond earrings the client had had previously made by us ! She was very happy ! We have just completed this diamond brooch as a special order for a diamond wedding anniversary, it contains a central diamond at 1ct and 8 matching diamonds at 1.60cts the set, mounted in 18ct yellow and white gold ! 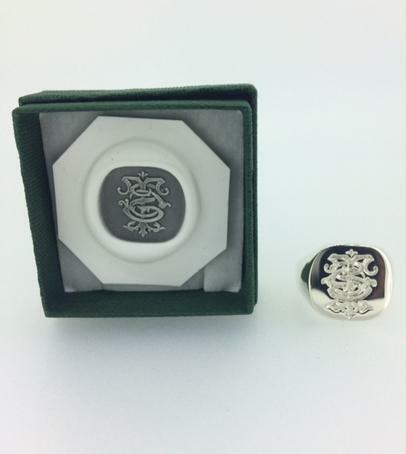 We have just finished this silver monogram seal engraved signet ring, it is shown here with the seal impression it makes ! Seal engraved rings to special order are taking 8 weeks , so order soon for Christmas delivery ! Opal is the birthstone for October, this necklace is a black solid opal mounted in yellow and white gold! We manufacture this diamond bracelet ourselves, it's 18ct white gold (solid) and set with 24 round brilliant cut diamonds weighing 2.75cts in total, colour H, clarity VS2 and is available at £3470. This ring is made in platinum and set with 5 round brilliant cut diamonds , all in rubover settings, making a modern twist on a traditional eternity ring . This ring is in 18ct yellow gold, set with 1 princess cut ruby, and 2 diamonds, made in our own workshop, making a very unusual gents wedding ring! We have just completed this brooch as a special order. it is an Irish Guards brooch manufactured in 18ct white gold , and pave set with diamonds , round emeralds and baguette rubies, with pale blue enamel. We can manufacture all of our regimental brooches diamond set- please contact us for prices. This is a pair of platinum earrings, set with 2 trilliant (triangular) diamonds weighing 1.10cts the pair, and 6 round , brilliant cut diamonds weighing 0.60cts the set, all diamonds being claw set. We have just completed this seal engraved signet ring as a special order, it is shown here with the wax impression that it makes. We can make any crest and on any size face and shape of signet ring. We have made this diamond bracelet as a special order, in yellow gold, and the diamonds rubover set in white gold, we can always manufacture this again in coloured stones, and in white or rose gold to your own specifications. We have made this white gold, ruby and diamond necklace, ruby is the birthstone for July, and we have made this as a birthday gift to a customers design. We have just finished this opal and diamond necklace, mounted in 9ct yellow gold, all rubover set ! We can make this with any stones and in white or rose gold too ! We have just completed a special order for a gents seal engraved signet, and a ladies pendant to match. This is a new item in out regimental range, it is 'The Gordon Highlanders' silver kilt pin , it measures 10.5cms and 5cms. We will be adding other kilt pins to our range very shortly ! This is a stunning emerald and diamond 3 stone ring, containing a central round fine emerald weighing 0.95cts and 2 round brilliant cut diamonds weighing 0.40cts each, all rubover set in yellow gold ! We have manufactured this family crest brooch for the Stanley family, for more information on our family crest designs visit our family crest page. We have made this ruby and diamond scatter cluster ring as a ruby wedding present (40 years ) with 4 pear rubies weighing 1.10cts and 12 diamonds weighing 0.58cts, all claw set in platinum. We have just finished this yellow and white gold, engraved wedding ring, our customer had lost their wedding ring that they had from us 24 years ago! We have made a replacement exactly the same ! This ring has been made in platinum and set with a central marquise shaped sapphire weighing 0.70cts and 2 pear shaped diamonds weighing 0.45cts pair, all stones are claw set. This necklace was made to replicate an antique pendant that was lost, and great sentimental, we have made it as close as the original as possible, set with seed pearls and peridot in the centre. Our customer was very happy with the finished piece ! Saturday 15th April 2017 . We have jus finished making his sapphire and diamond bangle, made from solid 9ct yellow gold, with 1 diamond and 1 ceylon sapphire in white gold rubover settings, this is now available in stock at £790. We have just completed this engagement and wedding ring as a pair , the shoulders of the engagement ring matching the same leaf design on the wedding ring, both rings were manufactured in platinum. We have just finished this necklace made from a customers old diamonds from an old ring, it was made from a customer's design - matching a ring and earrings we had made previously ! It was made in 9ct yellow and white gold- diamonds are round old cut stones in square settings. 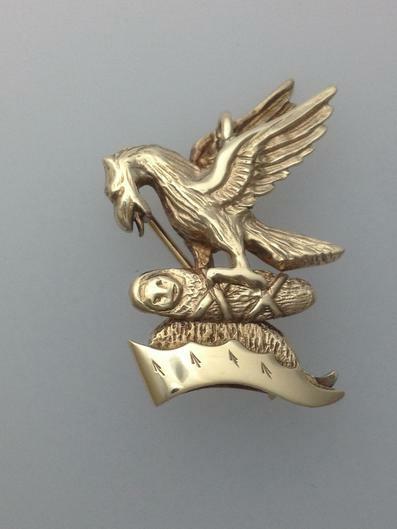 We have jusr started manufacturing this regimental ting for QARANC regiment, these are available now- £395 in 9ct gold, £865 in 18ct gold, and £140 in silver, the face measures 13mm x 11mm and delivery is approx. 10 days at the moment. We have just finished this necklace, mounted in rubover settings in 18ct yellow gold, and with dark ceylon sapphire and round brilliant cut diamonds! 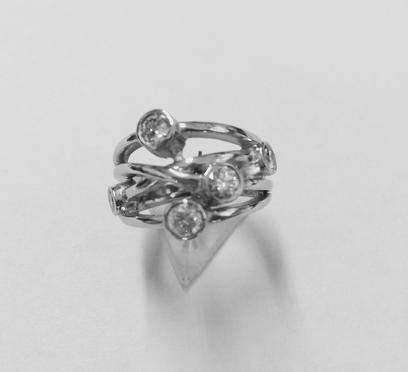 We have just finished making this cluster ring in plainum as a special order ! all rubover set with diamonds set randomly in a cluster style, a modern twist on an origial design. We have remodelled a customers diamonds to make this stunning random set 5 stone ring, all rubover set and mounted in platinum. Our customer was overjoyed with the result ! Amethyst is the birthstone for February. We have just finished this amethyst and diamond ring in 18ct white gold, the central square cut amethyst weighs 0.67cts and the 2 baguette cut diamonds weigh 0.17cts pair. A stunning birthday gift ! We have made this cultured pearl ring in 18ct yellow gold, sourcing a pearl to match the customers cultured pearl necklace, ( pictured) but a larger pearl suitable for a ring. 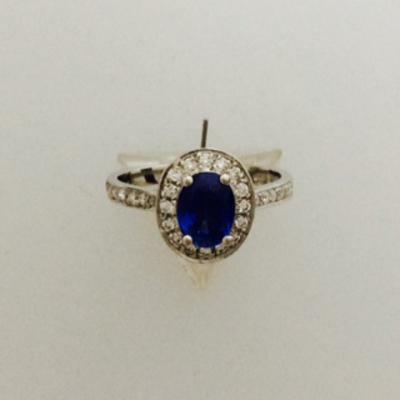 We made this off set crossover ring to our customers design! 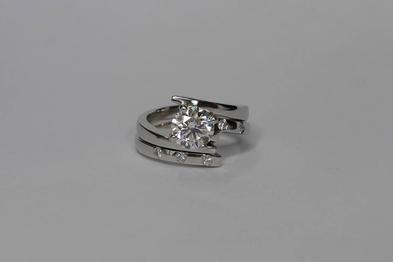 We have used the customers solitaire diamond engagement ring and remodelled it as the random set multi diamond ring, as a new engagement ring. making a new modern ring from a traditional engagement ring. She was overjoyed with the end result! We have made this platinum, sapphire and diamond cluster as a special order, with a fine sapphire (claw set) with diamonds grain set around and in the shoulders. The head allows a wedding ring to slot neatly underneath.